When Rodial first introduced their Tummy Tuck flattening gel, women were literally climbing over one another to get their hands on this instant sell out. The miracle potion might have meant women around the country would need to take out a second mortgage to pay for the £100 cream and keep up their new addiction, but then £100 is a steal for a cream which gives you the results of surgery. It claim’s ( & most women do concur) that it can flatten your stomach by two centimetres in eight weeks. Very impressive considering you have to do sweet nothing apart from rub your tummy with some gel every day. Now Rodial have upped their game even further and have introduced the nutritional counterpart to the cult favourite formula, the tummy tuck stick. Thankfully it has little to do with sticks other than the shape of the sachet. The stick is to be poured into a glass of water, mixed throughly and …drunk once a day. The dietary supplement was created to help digestion and reduce bloating, helping to flatten the tummy and waist through slimming natural ingredients. The beneficial ingredients include Green clay which is rich in silica and minerals which help to reduce bloating. Fennel Seeds which eliminate waste and gases, making the tummy appear flatter and finally pineapple and papaya are included for their enzymes which help spilt proteins and help the body to break down food faster. 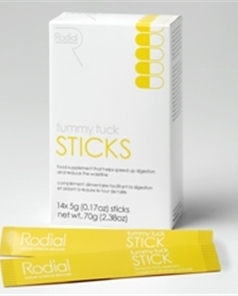 Rodial Tummy Tuck sticks are £48 for a pack of 14 and are available here.